With the NxT Road warning light, road safety goes hand-in-hand with sustainability. Offering reliable, wireless and fully autonomous operation, NxT Road safety lighting systems keep costs at a minimum while ensuring safer traffic control. Since the NxT Road is powered by the sun, it is the perfect solution for roads or mountain passes without access to an electrical grid. It can be installed anywhere. Generated energy is stored in a high capacity integrated battery. No matter how remote the location, the NxT Road will safely guide drivers through the night. 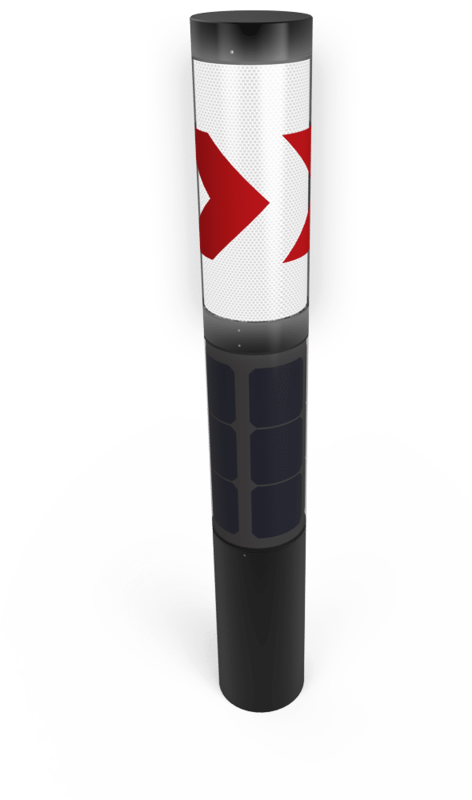 NxT Road chevron signs are powered by the same cylindrical solar panels as the cutting-edge, durable Soluxio solar light post. Their vertical orientation ensures dirt or snow cannot adhere to the warning lights or solar modules. By supervising the road safety systems through a remote monitoring system, the NxT Road offers reliability and safety in remote roads subject to unpredictable weather conditions. Using only renewable energy and greatly reducing materials and energy needed for installation and monitoring, the NxT Road offers superior road safety in an environmentally friendly way. Through a combination of high quality retro-reflection and dynamic LED lighting, the NxT chevron sign warning light makes it safer to drive at night. No cabling means quick and simple installation. Installation and exploitation costs are kept low since the NxT does not require cable trenching. High capacity lithium batteries form a buffer for longer periods of bad weather, so that the road safety light will always perform as desired. NxT road safety is 100% solar powered. Designed to last and with reparability and recyclability in mind, it is the sustainable road lighting of choice. The NxT road safety lighting system is designed to withstand the harshest conditions. From snowy mountains to burning deserts, this solar chevron sign will make any road safer. It features state-of-the-art solar technology. The solar cells have the highest efficiency on the market. Due to the unique and patented cylindrical solar panel, positioning the NxT solar road lighting system is not dependent of their orientation towards the sun. Their unique, distinctive light module reflects headlight beams while shining LED light in all directions. Multiple lights work together as a single lighting system to create special guiding effects. Their modular design allows for a tailored solution to every location, all the while allowing maintenance and repairs to be as easy as can be. Advanced on-board electronics make the NxT road safety lighting system smart. It continuously optimises its lighting scheme and adapts to both seasonal changes and weather conditions. Remote communication technology allows you to monitor and control the NxT road safety lighting systems from any location. This centralised method of monitoring inclines lower operational costs. Manufactured in a solar street light factory, the NxT road safety lighting system combines industrial grade materials with cutting-edge technology. The product is designed, produced and assembled entirely in the Netherlands. Installing the NxT road safety lighting system is a matter of digging a hole in the ground and placing the NxT Road in it. Configuration and monitoring can be performed wirelessly from any location. Since it does not need to be connected to a grid, this solar chevron sign warning light is the perfect solution for remote locations or any place where trenching electricity wiring presents an obstacle. The lighting scheme, as well as specific lighting effects, can be set according to the requirements of the chevron sign’s location. Multiple NxT road safety lighting systems can be linked to, for example, form a light guidance system that dynamically shows drivers the direction of a turn. All configuration can be done wirelessly and from any location. The status of every NxT road safety lighting system can be monitored remotely from a central traffic control centre. Important diagnostic data are easily readable. Visual inspection is therefore largely obsolete. Any defects will be detected immediately. Additionally, the lighting system does not need to be accessed physically in order to upload new lighting systems. This greatly reduces operational costs. Are you interested in the NxT Road safety lighting system or would you like to know more about it? Please send us your request in the form and we will contact you as soon as possible.